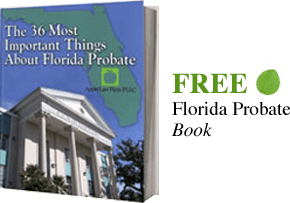 The foundation and the cornerstone of a person’s estate plan are often the Florida Living Will. The Florida Constitution states every resident in this state has the fundamental right to determine any decisions that pertain to his or her health. This right includes the right to refuse or accept medical treatment to prolong life when a terminal condition exists. We feel that the best solution for a living will in Florida is one that includes the living will, designation of health care surrogate, and HIPAA release in a single document as discussed below. This fundamental right should come as no surprise, of course, we have the right to choose what happens to our bodies. The issue becomes how does someone make this choice if they become incapacitated. Are you comfortable with letting someone out of your control make this decision? We recommend to all our Jacksonville and Ponte Vedra clients to draft a Florida Living Will. This document is a written declaration, also known as an advanced directive, which directs your family and healthcare providers on how to treat your body when you are no longer able to make the decision. As stated earlier, the Florida Legislature has given every competent adult the right to refuse or accept life-saving procedures when a person is in a terminal condition. A patient needs a Florida Living Will in a situation where the patient is unable to communicate whether or not he or she wants these procedures. This classic example of this occurs when a person is in a coma and is also facing another life-threatening condition. The likelihood of coming out of the coma is low as well as the life-threatening condition. Without an advanced directive like the living will, the family members have to decide for the incapacitated person. This situation can be especially hard when the family members don’t agree. A famous case that illustrates this problem would be the Terry Schiavo case. Schiavo’s relatives fought for years over whether or not she should keep receiving life-supporting procedures. This advanced directive allows someone to have the final say over how they want their bodies to be treated. Florida gives this document legal authority to have the final decision over whether to continue life support under certain circumstances and conditions. We can draft the document to meet the exact wishes of each person because everyone has a unique perspective on when conditions are acceptable. A Florida Living Will can tell doctors to stop care when a person is in a permanent vegetative state, brain dead, unable to move or bath themselves, or only able to breathe with the support of a machine. It takes the tough choice out of the hands of family members, and can save years of fighting and grief. A Florida Living Will can also name a Healthcare Surrogate to make all of the person’s health care decisions during a period of incapacity. This designation is extremely helpful when a person is under a condition that is not life-threatening, but the person is unable to make any decisions. A surrogate in a Florida Living Will can make the healthcare decisions like what procedures to take, and also has the financial power to pay that person’s bills from his or her bank accounts while they are incapacitated. We often recommend that our clients choose someone they trust. This person can be a spouse, another family member, friend, business partner, or anyone else that you think can handle the responsibility. Most importantly, this person should be someone that you trust, and someone that understands your healthcare and financial objectives. A Florida Designation of Health Care Surrogate will designate the responsible person. The maker of the document then signs the document in the presence of two witnesses. Once all the signatures are in place, we recommend our clients to send copies of the advanced directive to his or her physicians, hospitals, and other care providers. The client should keep several copies of the directive and make sure family members know where to find it. The Florida Living Will can be revoked or modified at any time. It is also important to have an HIPAA release in conjunction with a Designation of Health Care Surrogate to allow your agents access to your medical records to make proper decisions. The new privacy laws prevent your spouse or family from finding out medical information. We often prepare a single document that includes a Florida Living Will, Florida Designation of Health Care Surrogate, and Florida HIPAA release. By using a single document of which is referred to as a Combination Living Will Designation of Health Care Surrogate & HIPAA Release your agent will be able to make decisions for your which are not inconsistent with overall decisions found in the Living Will. By using separate documents your agents can show one document but withhold others to achieve their desired results and not necessarily yours. TO SET UP A Free Consultation*, CONTACT A FLORIDA LIVING WILL LAWYER ONLINE OR CALL US AT (904) 685-1200.